Managed Print Services | TierFive, Inc.
TierFive Managed Print Services's number one objective is to ensure your organization experiences the cost savings and productivity gains a managed print program can provide. TierFive Managed Print Service can significantly improve your employee to printer ratio. An optimal employee-to-machine ratio means fewer printers, less maintenance, and lower operating costs. Optimized printer fleets, efficient & modern hardware, and new user behavior can dramatically reduce energy costs, lessen, printing waste, and lower your total environmental footprint. TierFive’s MPS software tracks and captures all printing costs in one report so you can track expenses by department, eliminate unnecessary costs, and generate predictable monthly expenses. TierFive’s all-inclusive managed print service means you don’t spend time administering invoices, ordering supplies, or making service requests. Procure devices, services, and consumables from a single vendor. One vendor means one invoice. TierFive will be your all-in-one partner in managed print. With a TierFive Managed Print Service custom solution your operating expenses and capital expenditures scale as your business’s needs change. We will provide a detailed assessment of your current environment, including the number of devices, different makes and models, and the types of devices running. This is key to managing costs. Working with your IT staff, TierFive’s expert consultants will develop short and long-term objectives (including SLAs) to improve your printing services and management. The implementation phase includes printer management software deployment, consumables alerts and establishing procedures for requesting supplies and service. With the right software tools, you’ll be able to automate your print management, including supplies tracking and ordering, trouble shooting and repair, and usage monitoring. The TierFive MPS team will show you which devices to retain, which to reposition or repurpose, and which to replace. We also include periodic business reviews, TCO analysis, and green strategies. 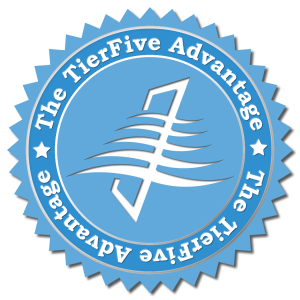 TierFive’s Managed Print Service is the easy, effective and affordable option for businesses that want to optimize their print strategy, reduce their IT burden, lower their environmental impact, and save on operating costs. Our MPS program is built on Canon’s industry-leading printer fleet management software and is backed by world-class delivery and support teams. Each provides support to thousands of companies and millions of devices worldwide.